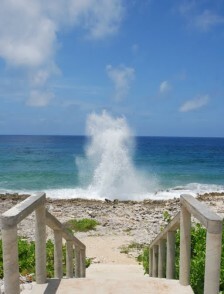 Grand Caymans Blow Holes are located 1.4 miles east of Frank Sound Road. Most powerful during periods of brisk easterly winds, the spray can reach heights in excess of 15 feet. Caymans Blow Holes provide a quiet place to stop and rest, take a picture and have a snack on your way to East End and Northside attractions. There are shaded picnic facilities situated across the street from Caymans blow holes, providing a comfortable place to congregate with friends and family for a picnic lunch, a game of cards or a tranquil retreat overlooking the beautiful sea.